When planning a patio project there are a few options you may want to incorporate into the design. These options include seating walls, outdoor fireplaces, fire pits, outdoor kitchens, and lighting. The little things that you do in planning your patio have a big effect on the ultimate outcome of the project. Here we show you some of the features that may bring your patio from mainstream to astounding. Many homeowners in Northern Virginia also like to incorporate some type of water feature in their patio, the sound of running water has a soothing effect ,and can add to the overall appeal of your patio. Features such as seating walls or fireplaces are usually built from cinderblock and finished or veneered with thin stone. Thin stone comes in a variety of colors, and looks. Click here to view samples of the thin stone we utilize in building our patio options. there are many different types of stone that can be utilized for your patio options. Most often thin stone is used to veneer all structures that you may want to include in your design. Listed here is some options of different types of the veneering stone use by Fairfax Contractor photo gallery of thin stone options. One of the best ways to emphasize your patio project is to include low-voltage lighting. With the latest technology in LED lighting you can set the mood and ambience of your patio by simply incorporating a little bit of lighting. The reasons to include a lighting system in your patio project include safety, custom design, and a professional finish to the overall project. Most of the lighting systems we install today utilize LED lighting, this is the standard of the industry. One of the big advantages of installing LED lighting is that is energy-efficient, and produces much more lighting than the old standby systems. One question we are asked is what exactly is LEd’S lighting 1st off, LED stands for light–emitting diodes. This lighting system is utilized by professional landscapers and contractors. One thing you may want to consider when designing a low-voltage lighting system, is to buy a larger transformer than you think is needed, that way your system becomes expandable if you want to add lighting into other parts of the yard. Before the concrete is poured for your patio project we should consider installing conduit to the outside perimeter of the patio near the transformer. That way we can easily snaked through additional electrical lines to expand your lighting scheme for your overall hard scape design. If you are considering building a custom patio in Northern Virginia you may want to include a outdoor fireplace. 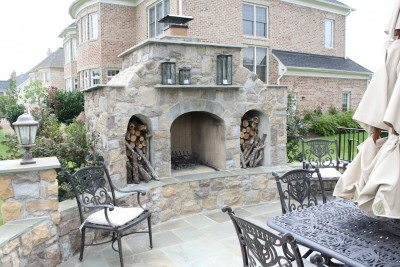 Fairfax Contractor can custom design and install a code compliant outdoor fireplace. Typically we build the foundation of an outdoor fireplace from block and veneer that block with thin building stone. If you’re considering including a outdoor fireplace with your patio projects we can custom design the perfect design. In designing a outdoor fireplace you may want to consider where it is going to be installed on your patio. Once a decision is made of where the fire place is to be installed, we will custom build all the features, and options one may desire in an outside fireplace. 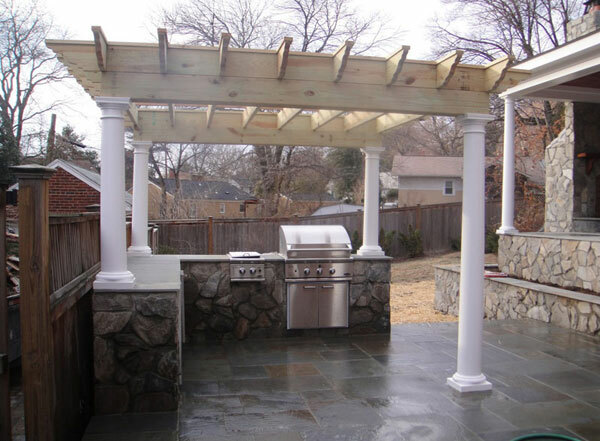 Many homeowners in northern Virginia want to include a outdoor kitchen in their patio design. The most important feature of a outdoor kitchen is a barbecue grill. There are many options when considering what type of barbecue grill you want to incorporate into your patio. The choices include, a built-in propane barbecue, a natural gas barbecue, or a wood burning grill. Whatever barbecue configuration you want to include in your patio, the main design element is location. When designing a patio with an outdoor kitchen, one must consider the ability to exit your home, and have the outdoor kitchen close to the interior of your home. Beyond installing the quintessential grilling and barbecuing station, other options include a outdoor refrigerator, sink, workstation, and perhaps even a pizza oven. Installing and designing a custom Pergola for your patio will give you two great advantages, one it certainly has class to the project, and also offers shade from the midday sun. 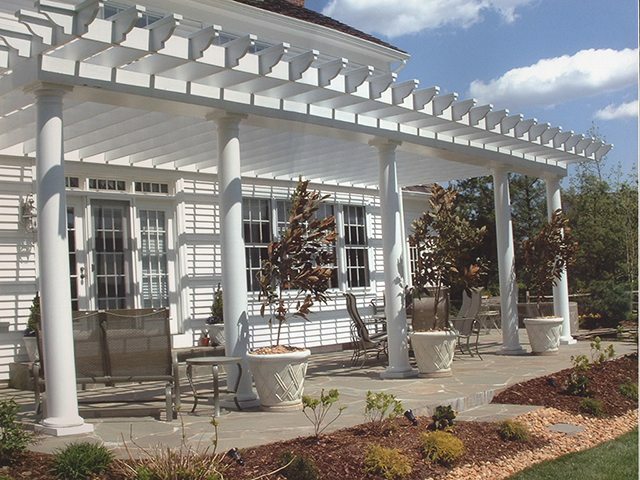 We can design a wide variety of different pergolas for your patio that are constructed out of either pressure-treated lumber or low maintenance PVC. Typically we will excavate the footings for the support columns before we pour the the concrete for your patio. Once the support columns, which are typically six-inch by six-inch pressure-treated lumber, we will monotonically pour for the footings and and the patio at the same time. Working with your designer can come up with a wide variety of designs for the upper structure of your patios pergola. Some of the options we offer our decorative fiberglass columns that will in case the 6 x 6 pressure-treated lumber or we can actually construct a water table of stone around the base of the wood column. Incorporating a water feature in your patio, will not only give you ambivalence, but a very unique piece of artwork. The sound of running water in your backyard playground will definitely enhance your guests experience at your patio. 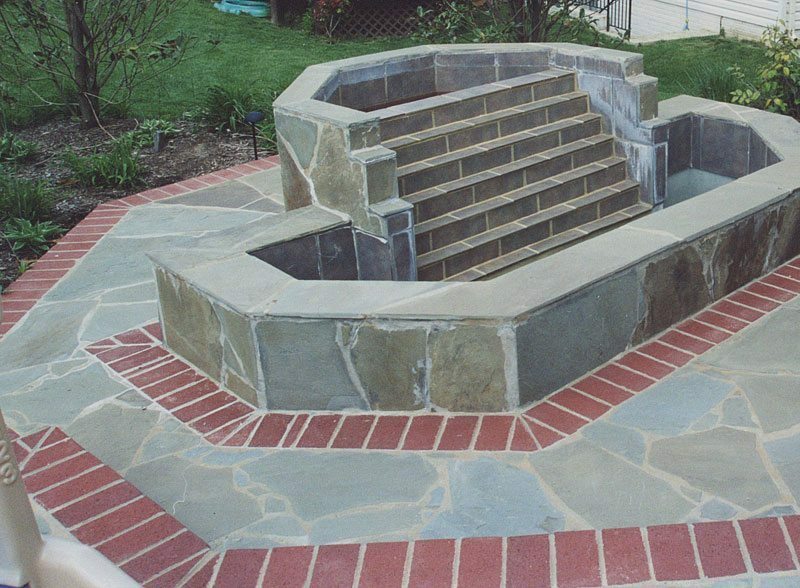 Fairfax Contractor can design and build a simple to very complex water feature for your outdoor living space. Though the design may be simple the effects are quite big when adding a water feature to outside hard scape projects. We have the ability to design and build the water feature of your dreams.